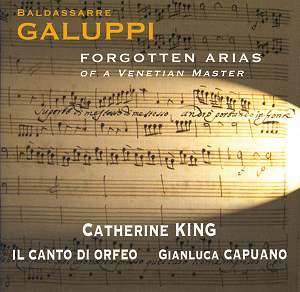 Baldassare Galuppi may be little more than a footnote in the history books but during his lifetime he was highly regarded. He was known in the main as a composer of comic operas, collaborating with the playwright Goldoni. He also wrote serious operas and was even invited to the King�s Theatre in London�s Haymarket where he was highly successful for a number of years. He wrote other kinds of music as well and there seem to be some other CDs available at present: La Diavolessa, Il Mondo alla Roversa, Messe per San Marco, complete harpsichord concertos and a disc with motets. Also we should not forget Peter Seivewright�s Divine Art project to record the complete piano sonatas � all ninety of them � across ten CDs. The first three volumes have already been issued: Divine Art 25006, 25007 and 25015. The disc under consideration offers a glimpse of his operae serie plus a couple of other arias. Performed by the extremely accomplished Catherine King and the period instrument ensemble Il canto di Orfeo, it is a knock-out. The band: solo strings, theorbo, harpsichord and occasionally supplemented by two natural trumpets and an oboe, play with an energy and freshness that strikes the listener dumb with amazement. The fast and dramatic music, of which there is a lot, is almost frantic, which doesn�t mean that it is unsubtle. They can also be quite sensitive in more contemplative moments. But it is the rhythmically incisive and explosively powerful music that hits the listener right in solar plexus, like a hard-rock band in full flight � though more merciful to your eardrums. Which cannot ever have peace. Is slaughter, death and ruination. One shudders � which Ms King does not. She throws herself wholeheartedly into the text and music with marvellously assured singing. There are obviously no technical obstacles for her. In Voi che languite (tr. 7), with a fine orchestral introduction and beautiful melodic line, she explores the lowest range of her voice to good effect. Cedo alla sorte (tr. 8) to a Metastasio text, is again fast and vital with trumpets lending a martial touch, where both the wind and the sea are enemies. Towards the end the trumpets imitate the unhappy but intense singer. When the cost is cowardice. And allowing you to go on living. The whole aria bubbles with life. The two concerti, which in a way become resting points between the high octane dramatic outpourings, are musically contrasting but similar in overall structure: a slow, elegiac first movement, marked Grave, a more lively second movement (Spiritoso) and a whirling Allegro rounding it off. In the B flat major concerto there are some inventive sound effects in the finale: some pizzicato playing, a miaowing violin and some daring dissonances. Good notes are provided in three languages and we get all the sung texts with translations. Everyone interested in baroque opera or accomplished singing in general needs to hear this disc, which functions as a mental equivalent to a vitamin injection at the health centre.